Learn about the outer islands of Hawaii, by reading Touring Hawaii's Outer Islands - Hawaii, Kauai, Maui by Amy Bednarcik, traveler and WTA Staff Member. It features all you'll need to know to plan your trip including how to get there, objective information on places to stay, and eat, and things to do. At the end of the article, we've provided a summary of the contact information for your easy reference. Enjoy! For vacation planners from the East (my husband, Mike, and I live in Maryland), the prospect of visiting Hawaii raised old questions. What are the real trade-offs between the convenience and familiarity of the Caribbean, just at our southern doorstep, and a more expensive journey almost a quarter of the way around the globe and into the relative unknown? In years past, when time and money were the deciding factors, the Caribbean always won. Last August, though, we finally made a long-delayed comparison. Our 15-day trip was divided between Oahu, Kauai, Maui, and the Big Island of Hawaii. Oahu was our "home base" for the trip as a big purpose of it was to visit some very good friends of ours who are based in Honolulu at the U.S. Army base, Fort Shafter. So, we spent the first and last 5 days of our trip with them, and took the middle five to see some of the outer islands. (Watch for the destination article about Oahu for an in depth review of our time there). We started our inter-island tour with 2 days on Kauai. One of the outstanding features of Kauai, beyond its great natural beauty, is its relative lack of commercialism. There are stunning resort areas like Princeville and Poipu Bay, wonderful golf courses, and tour companies featuring boat and helicopter rides around the entire island. They are all designed and operated in a way that puts the spectacular environment ahead of all else, and seldom at the expense of nature. We stayed at the Holiday Inn Sunspree Resort that is only 7 miles from the airport in Lihue. It was very reasonably priced ($125/night) and our package included a full breakfast buffet each morning. (On a scale of 1-10, we rate the buffet as a 7.5. We had dinner here, too, and give it a rating of 6.) The resort is right on the water and is fairly centrally located on the island. There are several lovely resorts on the island with many by major hotel chains. The high end ones can run $300 or more a night, so book early during peak season (summer months) to ensure availability and good rates. And, by early, I mean a few months out. We waited until only about 4 weeks out to make our airline and lodging reservations for the inter-island tour and found ourselves in a tough spot. The summer months are truly high season throughout Hawaii and many places were already booked. I tried obtaining reservations on my own, but after several long distance phone calls and not much luck, turned to our travel agent. She more than earned her commission and got us into some nice accommodations at reasonable prices, and took care of the airline tickets, too. Although driving is the principal means of transport, on islands other than Oahu many roads are limited to two lanes, are very congested, and local driving patterns tend to be seriously slow. Plan for your driving time to be twice as long as what it normally would be. The most dramatic landscape is often the least accessible, as on Kauai where the highway cannot complete its circle of the island because of the Alakai Swamp and the precipitous Na Pali cliffs. Such barriers as the mile-high mountain comprising much of Kauai limit driving in the interior. Yet, with all of the congestion on the roads, Mike and I often wondered how there could be so few people at most destinations. We started our exploration of Kauai with a drive up north to Hanalei Bay. There are several pull-off areas along the way for scenic views of valleys, taro fields (where poi comes from), and waterfalls (Opaekaa Falls was lovely). You'll drive by the Princeville Resort, renowned for its location above Hanalei Bay and amenities including the most difficult golf course on the island. Hanalei is a quaint town with lovely scenery. We had a late breakfast at the Wake-up Cafe, a local eatery. The food was good, atmosphere casual and friendly. They feature surfing art and are right across the street in Hanalei Center, a small shopping center where we found some great art of Hawaiian landscapes. There's also a charming courtyard Italian restaurant here called Luna Cafe. We then headed to Po'ipu Bay on the southeast side of the island for an afternoon round of golf at Po'ipu Bay Resort Golf Course where the PGA Grand Slam of Golf is played. It's a beautiful course with a lot of sand, but very playable for both men and women. The views are stunning and there's even a eucalyptus tunnel. You can get reduced rates if you play in the afternoon. It wasn't difficult reserving tee times, but we recommend calling ahead of time. That evening we had a delicious dinner at Cafe Portofino's not far from Lihue and near the Kauai Marriott & Beach Club. The Italian cuisine was delicious and the menu included veal, seafood, pasta, beef and chicken entrees $16 and up. The next day, we headed west for Waimea Canyon, the absolutely spectacular Grand Canyon of the Pacific.The 90-minute drive from the island's main airport and tourist center at Lihue takes you along the southern coast through coffee plantations and across fields of sugar cane beside the blue Pacific. The road winds to the top of the canyon and crosses two state parks, one with a lodge and museum, and terminates at Kolalau Lookout. (If you have trouble with motion sickness, be sure to sit in the front seat; you may even want to take a couple of motion sickness tablets.) If you're looking for further adventures on your way out, take the spur to Kekaha and then follow the coastal road north to its western terminus at Barking Sands Beach. 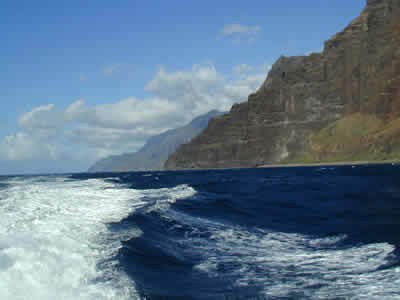 Since Port Allen is on the same route of the Waimea Canyon, we opted for an afternoon boat tour of the Na Pali Coast. It was highly recommended by our friends, and our waitress from the Wake-Up Cafe in Hanalei recommended the A Na Pali Eco Adventures tour company. Their boats burn recycled vegetable oil for fuel which eliminates noxious fumes that you can get from other boats. When you look at a map of Kauai, the Na Pali Coast is not far from Hanalei Bay, and until fairly recently, this is where you would catch your boat tour. However, due to environmental reasons, the tour companies were forced to move their operations to Port Allen, at the other end of the island. This means that shorter boat tours are no longer available as it takes about 1-1 1/2 hours just to get to the Na Pali coast from Port Allen, so you're looking at a 5-6 hour tour. We booked our tour the previous day, which is strongly recommended as they do fill up. You can do a 7:30 a.m. or 1:30 p.m. tour. The cost was $115 per person ($105 if you pay in cash or with travelers checks). We boarded a large power catamaran that seats 35 or so passengers. You choose where you want to sit and it offered seating inside of the cabin, although it is not fully enclosed. If you're prone to seasickness, sit towards the back of the boat and pop a couple of motion sickness tablets (non-drowsy formula as you'll want to stay awake for the sights!). I'm very prone to seasickness, but did what I just suggested and didn't have any trouble at all; the water was pretty rough that day, too. Dress in your bathing suit and bring towels as there is snorkeling and a good bit of spray from the water. The boat tour takes you right along the Na Pali Coast which has provided the backdrop for opening scenes in many famous films and uncounted lesser epics set in ethereal, romantic, and rugged landscapes. 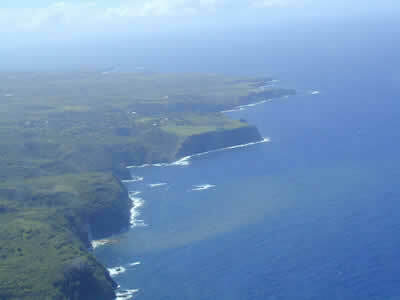 The needle peaks and 4000-foot cliffs are at least as impressive from the sea as from the air. You can enter the area by foot as well, and on any number of adventure tours by raft or kayak. Some trippers paddle along the coast for 10 or 12 days, camping as they go. Some hike down the cliffs, not an adventure for the flabby or if you have trouble with heights. You typically will not see much waterlife during the summer months, but we got lucky and saw some spinner dolphins and sea turtles. We saw some fish while snorkeling, but the water was rough that day, so the snorkeling only lasted about 1/2 hour. Also, don't expect to see many active waterfalls during the summer months, as this is typically the dry time of the year. We broke for lunch after snorkeling and it included tasty sandwiches, salads, munchies and soda or water. The captain played tour guide throughout, pointing out certain landmarks and points of interest, and the crew did a wonderful job in making sure we had a good time and were comfortable. Overall, we highly recommend you take the time for this excursion. See the summary section for contact information on this and other tours. I said earlier that we were interested in seeing how Hawaii compared to the Caribbean, considering the amount of time and expense to get to Hawaii versus the Caribbean. We knew the trip was worth the difference in our first day on Oahu, but we fell in love with Hawaii when we hit Maui. Maui ended up being our favorite island of all of them and our next trip to Hawaii will primarily be spent on Maui. We flew into the Kahului Airport and drove about 1 hour to Lahaina, our base on Maui. Lahaina is a terrific little town that is a favorite spot for tourists including many high-profile people. The town sports quite a bit of history and landmarks, great shops, a movie theatre, bars and restaurants. In the heart of the town, about two blocks from the water, we found the Plantation Inn, a great B&B for $155 a night, including a nice breakfast.That was reasonable – prices throughout the island run to $350 and up. Our first afternoon was spent on the Kapalua Village Golf Course. This is one of a trio of courses in Kapalua, and is considered to be the most scenic. It lived up to its reputation with lovely vistas of fields and the ocean. We even got to experience a double rainbow, which was breathtaking. The course is very player friendly and you can get discount rates if you play after 2:00 p.m. of roughly 1/2 price ($135 regular rate/$65 after 2 p.m.). On our way back to Lahaina, we stopped in at Roy's Bar & Grill for dinner. This is a well-known franchise across the Hawaiian Islands and into the West Coast of the "mainland." It's very trendy and chic with prices to match, and the menu is varied, but features many fresh fish dishes. We were in the mood for pizza, and it was out of this world. The service was excellent and very attentive. We had only a day and a half on Maui, and we were tired of driving, but we wanted to see more of the island including the volcano, Haleakala. So on day two, we opted to go the short distance to K'aanapli for some snorkeling in the morning, after making reservations for an afternoon helicopter tour. For the snorkeling, we relied upon Boss Frog's, a local Lahaina rental place for snorkeling and surfing gear. They were extremely helpful and friendly, but really busy, so get there early. The snorkeling gear runs anywhere from $1.50 to $8/day per person. They know the best snorkeling spots on the island and can give you recommendations based upon that day's weather and wind conditions. Their recommendation took us to the shoreline of K'aanapli in front of some of the resorts that line the K'aanapli shoreline. The resorts looked really nice with great beach frontage. We parked at the Whaler's Village, which is an outdoor shopping center that gets packed from about lunchtime on. We got there before the shops opened, so parking wasn't a problem (there is a fee for parking), then walked down the beach to the snorkeling area in front of the resorts that line the beach. It's a really good snorkeling area and convenient. We saw a variety of fish and some snorkelers were fortunate to see sea turtles. After lunch back in Lahaina at a local sub shop, we headed off for our helicopter tour. There are several operators to choose from. We called a few of them and then tried out the Activity Warehouse which offers reservation services and discounts on many local attractions throughout the islands. They were very helpful and found us a reservation with Air Maui. They got us booked closer to the time we wanted, at a better rate, and in our choice of helicopter (the Warehouse gave us good advice on the type of helicopter to fly in based upon comfort and view ability). Other well-known operators are Hawaiian Tours and Blue Hawaii. Plan to spend anywhere from $119-$150 per person for a 45 minute flight. It's well worth the money, though, as you see things that would take you hours to see by car or on foot and some you wouldn't be able to see except by air. The views and scenery are breathtaking. You see the lushness of the island laced with several waterfalls, forests of the rare Koa trees, spectacular black and white sand beaches, and dramatic shoreline - it was the essence of our expectation of Hawaii. The tour also included craters and the sides of the volcano Haleakala. You probably won't get to the very top of the volcano due to cloud cover, though. You'll also see sugar fields and the town of Hana on the other side of Maui, which looked like a quaint and beautiful place to visit, if you have the time. If you opt to drive to the top of Haleakala, you need to get up before dawn, because if you give the day any kind of a head start, all you're going to see is the clouds.From Lahaina, it's a 2 1/2-hour trip each way, and the view begins to disappear by 10 or 11 AM. At 10,023 feet, the top is about 30 degrees cooler than at sea level so take a sweater or light jacket. After spending the rest of the afternoon relaxing by the Plantation Inn's courtyard pool, we supped at a fun place called Cheeseburger 'n Paradise which is right on the water along Front Street in the middle of Lahaina. It's a great location and is an open-air restaurant. We got there relatively early, but it was packed. While waiting, they have a main level and upstairs bar, but you can only get served if you have a seat at the bar. They manage the crowds very well, though, and the wait was only 15-30 minutes. We ended up with a couple of seats at the end of the upstairs bar where we could people watch on the street below. We decided to go ahead and eat there and had one of the best, you guessed it, cheeseburgers we ever had. Their fries are delicious, too. Be sure to take your camera, as this is a great location to catch one of Hawaii's famous sunsets either from the restaurant or on the sidewalk along Front Street. . The final day of our inter-island tour was spent on the Big Island of Hawaii at the Volcano National Park. You have two airport choices, Hilo on the East Side and Kona on the West Side. We flew into Hilo, as it is the closest to the park, about 45 minutes. What struck us immediately about this island is its environment. There were times that we felt like we were in North Carolina with all of the pine trees and greenery, and other times we felt like we were back in the mountains on the east coast. Unlike the other islands that had some real dry, brown areas, this side of Hawaii was lush, cooler, and not as tropical feeling. It was a real contrast, but a nice one. The drive to the park was on a two-lane road and not crowded at all. In fact, it was so not crowded that there were times we wandered if we were on the right road. You're climbing in elevation the entire drive until you reach the park at 4200 feet. Be sure to take a jacket and expect a cool wind and rain or misty conditions. The Hawai'i Volcanoes National Park is open 24 hours a day all year (www.nps.gov/havo; 808-985-6000). Our time was finite for our tour of the park, so our first stop was at the Kilauea Visitor Center(open daily from 7:45 a.m. - 5:00 p.m.) where we received good touring strategies from a very helpful ranger. He told us the things we wanted to be sure to see and showed us the way on the useful park maps. The center has a film about the park which I'm sure is a good introduction for your sightseeing. After getting a couple of sandwiches at the Volcano Village (this is about a 1/2 mile outside of the entrance of the park), we set off on the 11 mile Crater Rim Drive. This drive literally circles you around the park with scenic pull-off areas along the way. Even though we saw quite a few visitors at the center, the drive was not crowded at all, so we could go at our own pace, and it was in good condition. which has a terrific view of the crater with the history of the volcanoes and information on volcanoes in general. On your drive, you'll see the Rift Zone and the spot where lava from the 1982 eruption flowed across Crater Rim Drive. Also stop at the Halema'uma'u Overlook where you can walk to the crater's edge. Native Hawaiians still practice ancient traditions here. Off of the Crater Rim Drive, we took the Chain of Craters Road which is a 40 mile roundtrip descent of the volcano mountain towards the ocean. We thought this was the best part of our tour. It's a spectacular sight and the side of the mountain is lava that hardened as it flowed towards the water, so the scenery is very dramatic. We didn't have the time, but you can pull off and walk out to see Pu`u Loa petroglyphs. We did take the time, though, to stop and view the Holei Sea Arch which is a beautiful and dramatic arch carved out of lava by the pounding surf of the ocean. It's at the base of your descent and you have to watch carefully for its road sign or you'll drive right by it. Along this part of the road, you can walk over the lava cliffs that have sheer drop offs into the ocean below. It was an incredibly windy day and the surf is unbelievably strong, so hold on tight to any little ones. As you peer over the cliffs, look for other arches, sea caves, and stunning black sand areas. With the aquamarine water and white froth of the pounding surf in front of you and then the black lava ridged mountainside behind you, you really do realize just how insignificant man can be in the grand scheme of nature. Not far past the Holei Sea Arch, the Chain of Craters Road ends at a small area where you can park and get a far-off glimpse of an actual lava flow of the volcano into the ocean. What you'll see is the steam rising from the lava as it hits the ocean. 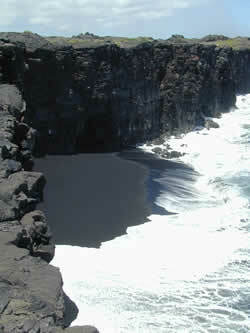 You can walk out to the flow, but be prepared for a rigorous 4-5 hour hike over hardened lava. Heed the park's warnings and take plenty of water. It can get very warm because you've dropped down off the top of the volcano and you're on the sunny side of it, plus you're walking on nothing but hard lava. You can even make the walk at night; you'll need flashlights, but you'll see the vivid red of the lava flowing into the ocean. It's supposed to be quite a sight whether by day or night. Once back on Crater Rim Drive, we took the road to Devastation Trail that takes you to where the cinder eruption of 1959 took place. It was amazing how over 40 years later, there is still very little plant growth. The park has set this area up as an observation point tracking the effect of volcano eruptions on plant growth. While you're viewing the eruption area, you're taking an easy 1/2 mile walk to the Pu'u Puai Crater that is worth seeing. Our final stop was the Thursten Lava Tube, which is a 20-minute walk through a tree fern forest to and through a prehistoric cave-like lava tube. The tube itself is 1/3 mile and is an easy walk. It was fascinating especially when we stopped to imagine the force of the lava as it creates it own trails through the mountain. This was probably the most crowded stop, but it didn't interfere with the experience. We ran out of time, but there are plenty of other sights to visit at the park. Be sure to stop in at the Volcano House. It was highly recommended for its pies among other things. It offers overnight lodging, too. Also, if you want to hike, there are several different trails available to you including a 2 hour one that takes you into a crater where you'll cross still steaming lava flows. There are other drives as well such as the Hilina Pali Road, an 18-mile round trip to the Hilina Pali Overlook. We returned to Hilo earlier than we expected, so we decided to go in search of Rainbow Falls. The falls is just north of Hilo, so we got to see some of the town. It appeared to be a small, older city, but quite active. Rainbow Falls was a nice side jaunt; it's a beautiful waterfall that you can get up close to. It's a popular spot for the tour operators as we saw a couple of their buses there, too. There are many other things to do and see on the Big Island, and we regret that we didn't have the time to explore further. Be sure to look up the Parker Ranch and Museum and the Mauna Loa Macadamia Nut Visitor Center. Also, plan to visit the 13,677-foot Mauna Loa and Mauna Kea, just 129 feet taller and the highest point on the Big Island. Both sport snowfields at their crowns - not unique, but a relative rarity this close to the equator. The latter is home to a world class astronomical observatory.If we make it back to Hawaii, we plan to revisit the Big Island and take in the sights we missed. As you can imagine, our inter-island tour flew by, but we never felt rushed or weary from all that we did. I think a lot of this had to do with us choosing activities that we find relaxing, e.g. golf, snorkeling, sightseeing, but it also had to do with the Hawaiian hospitality. Never have we been somewhere where we were always warmly greeted and extended such open-armed hospitality. While we planned our airline, lodging and golf ahead of time, we didn't plan any of our other activities. Along with the locals, we found Fodor’s very helpful, especially for places to eat and sightseeing activities. Another great planning resource is Activity Warehouse, a private company that can sort out availabilities and save you a fortune in last-minute bookings. For driving assistance, use the island driving guides; there's one for each island and they're far more complete and reliable than maps in travel brochures, if also more cumbersome. Maui - Plantation Inn Bed & Breakfast, 800-433-6815, www.theplantationinn.com Look to Fodor's Guidebook and your travel agent for other specific properties. Roy's Kahana Bar & Grill - Kahana Gateway Shopping Center. Notice: This information is current as of August 2001. It is recommended that you contact the numbers, and/or visit the web sites above to determine any changes to the information.